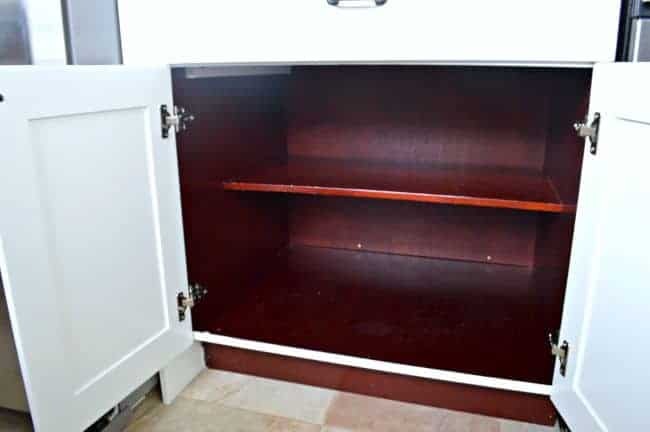 We are working hard so that we can finish up our kitchen reno, and we got one step closer this weekend by putting some of our things back into the cabinets. Oh happy day! This post won’t have beautifully styled pictures and some of them are downright scary, but here goes. 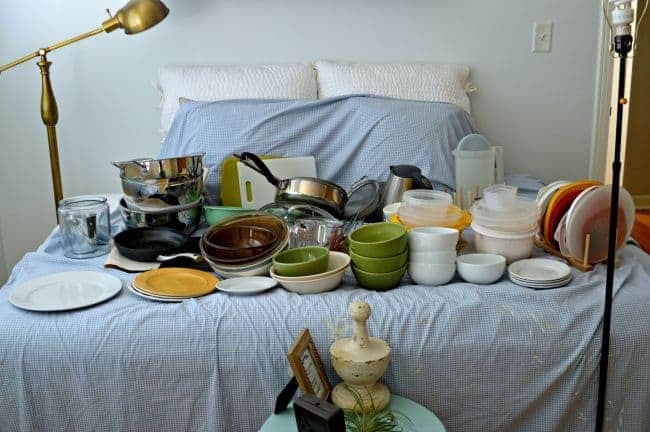 Yikes…yes, that is my pretty guest bed with all of our dishes and pots and pans on it. We’ve been looking at this mess for the past few weeks, but no more! We were able to put all of that, and more, away this weekend. The reason why we were able to put some of our things away is because we finally got our countertops! I want to save all the juicy details for the next post. We’re still working on getting them in and, as soon as that’s done, I’ll share pics and give you the 411. This is the first time we’ve ever done something like this and we’re learning as we go, so it’s taking us a while to do it. This is what we had to build so we could pick them up from the store. *This post contains affiliate links. See disclosure. 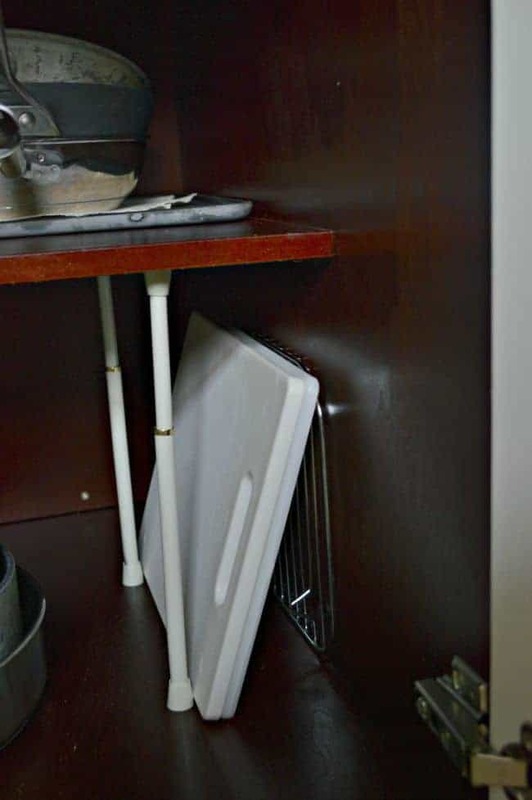 I did, however, want to share a cutting board storage solution with you. We have a small galley kitchen, with limited storage, so we have to be creative in how we use the space. 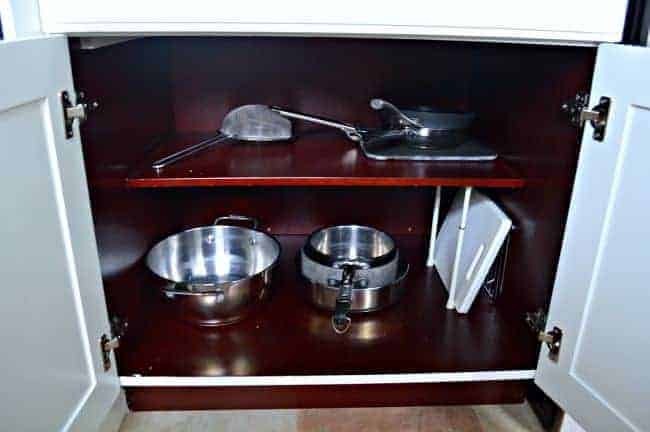 Our pot and pan storage cabinet is particularly challenging, it’s low and deep with a fixed shelf, which makes it difficult to store certain sized items. One of the things I’ve struggled with, in this cabinet, is our cutting board storage. I would try to prop them on the side behind the pots but if you moved the pots, the boards would fall. So to keep them up once and for all, I used two small tension rods, from the floor of the cabinet to the shelf, to give them a standing spot of their own. These would be great to use for organizing your baking sheets too. 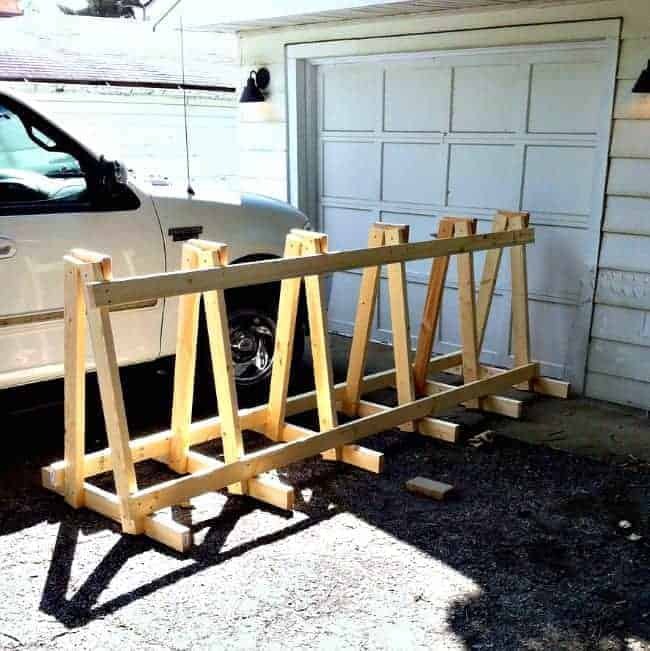 You can easily put them wherever you need them and…Voila!, no more fallen boards. Quick, easy and cheap. 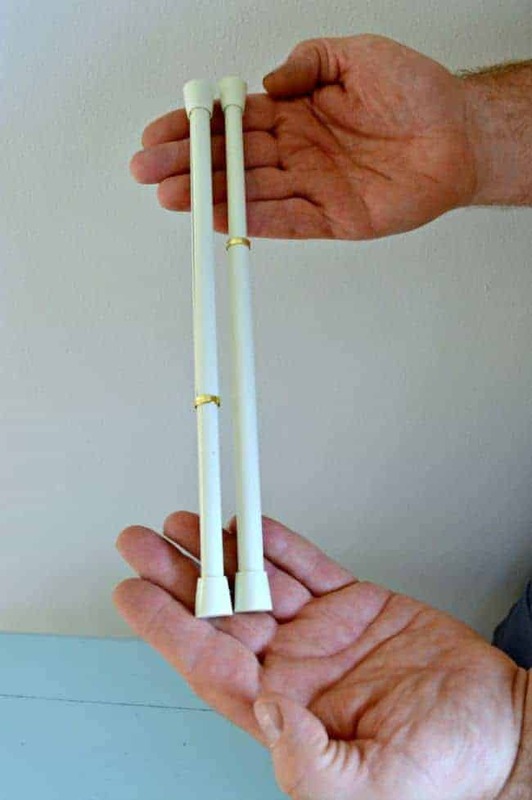 I got my rods on Amazon *(affiliate link) for about $10. The small size I needed was tough to find in my area, so I had to order online. How about you? 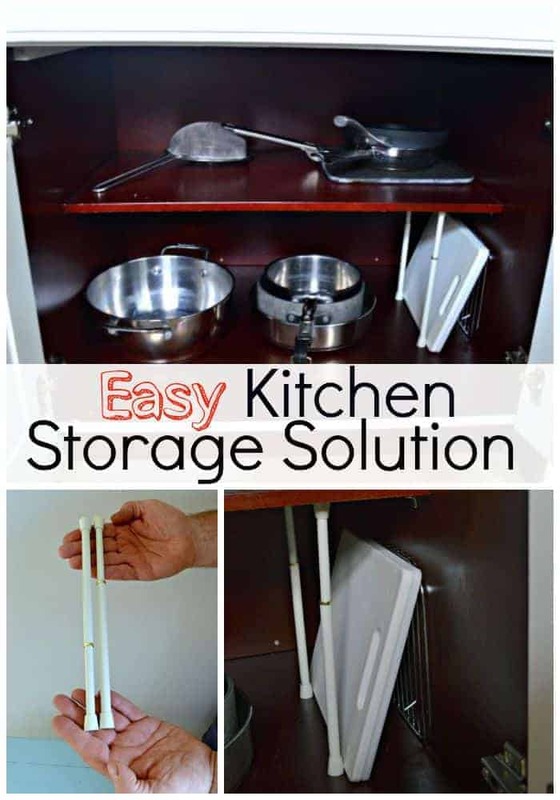 Do you have any quick and easy kitchen storage solutions? 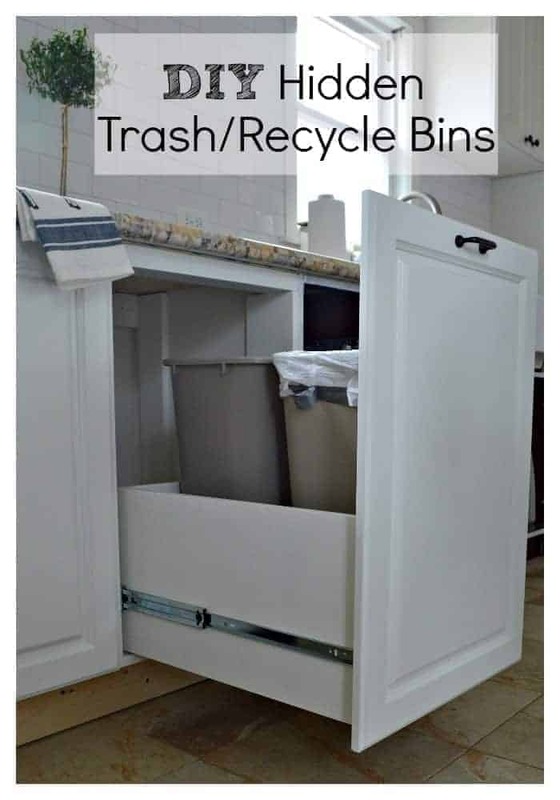 Check out my other post on storage in the kitchen, the hidden trash and recycle bin cabinet we built. 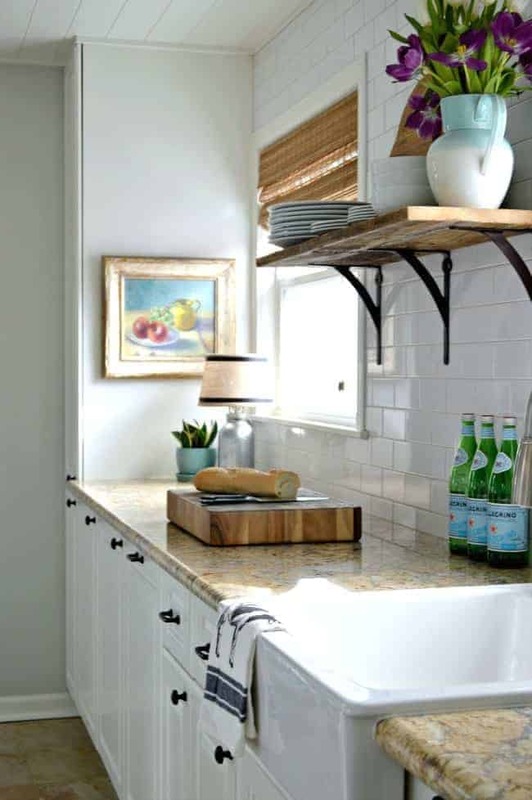 You can also check out the reveal of the kitchen remodel. Super easy idea. But how can I keep all my pot and pan lids together? I have shelves that slide in and out. Convenient but there are so many of them they all slide every which way. Thanks for any answers. I have a sliding shelf now too Anne, and I use one of those lid holders, something like this http://amzn.to/2FxL3Q0 (this is an affiliate link but it won’t cost you anymore to buy when you click on it). It really keeps my lids neat and in order. Hope that helps.Thanks for stopping by. This is a wonderful idea and I will probably use it for my bakeware as well. Hope the reno is finished soon and thanks for the great tip! What a super idea! You know I love the quick and easy route, so this is the perfect fix! 🙂 I can’t wait to see the countertops!! Thanks Kim! It’s awesome when a project literally takes 5 seconds and now my cutting boards don’t do that annoying slide in my cabinet. 🙂 I’m hoping that the countertops are finished this weekend…fingers crossed. Ugh, the ever annoying cutting board slide. You pick them up just to have them slide down again. I’m glad you found this useful. So far so good with mine, not one slide since I put the rods in. 😉 I’m hoping we’ll have the countertops done this weekend, barring any difficulties. I’m ready for them to be in and done. Hope you’re having a good week Debbie! What a great idea! I need to make some for our bakeware. 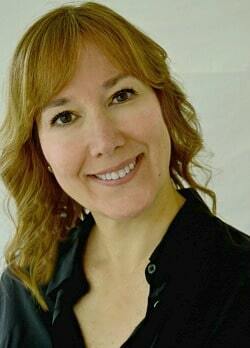 Thanks so much Pamela! Using them to store bakeware is a great idea. I saw this same thing on Pinterest for hanging spray bottles across the width of the bathroom vanity cabinet. Your idea is great! I have my cookie sheets and cooling racks standing in my cabinet next to the stove and they always keep falling over. I definitely will use this for that. Thanks! Ahhh, yes, now that you mention it, I saw that too at some point. My original thought was to use it for my cookie sheets but they are too tall for my cabinet, because of the darned shelf. I’m glad that you’re able to use this idea. Thanks for stopping in today and I hope you have a great week! What a brilliant idea – I would have never thought of this – it’s just perfect !!! I like you cutting board idea..I have one that’s even easier!! Buy a collator for files etc., you cant find them at Target etc. I found mine at Sal. Army..(metal holds up better! Measure your cabinet most are standard size. Put in your cabinet. Slide cutting boards, baking sheet pans, cupcake pans !! WORKS GREAT !!!! don’t tell any one. You just have to remember to take them out before preheating. Can’t wait to see the counter tops! I appreciate the suggestions and I’m glad you stopped in for a visit. We’re still working on the countertops but we’ve made lots of progress. Can’t wait to share.